In one of my projects, the client had a requirement to maintain versions of his RESTful APIs. They had a few APIs that were being consumed by some vendors and they later added a few other vendors in their kitty who wanted some additional features in those APIs. Our client thus decided to maintain versions of their APIs and asked us to strategize this change so that it wouldn’t affect existing vendors. This article is all about the strategy we adopted to cater to their need. The question is, “How should we version our RESTful API(s)?” There’s a lot of debate on what is the best strategy. The main debate comes down to identifying the version via the URI versus identifying the version in the header. One must explore all the options and select the best possible strategy for their business problem. Based on the existing architecture of our client’s architecture, we decided to version the APIs via Attributes-based routing. Supporters of the Attributes-based routing strategy claim that REST is all about resources and a Web API is a contract promising that a given resource will exist at the specified URI. For example, a URI pointing to version V1 should give resources corresponding to version V1, and a URI pointing to version V2 should give resources corresponding to version V2. We will create folders called V1, V2, etc. within the Controllers folder. The V1 folder will contain existing APIs and V2 will be used for new APIs. Now, create a copy of that controller inside folder V2. The namespace of this file is <<ProjectName>>.Controllers.V2. Feel free to add more methods in this controller as per your needs. The answer is NO. MVC identifies the controller to be called based on the unique name identified by the route attributes. It doesn‘t matter in what namespace the controllers exist because MVC just identifies the correct controller with the unique name. To work around this shortcoming, we will use attribute-based routing with custom constraints, and we will also add a custom controller selector that takes the namespace into account when looking for the matching controller class. We thus decided to inject our logic into the MVC controller selection pipeline to enable MVC to consider namespace while selecting the correct controller. We had to write a custom logic for this. For coding, we used Microsoft Visual Studio 2013, C# 4.0, and WebAPI2. Create a new MVC project and add all appropriate references. 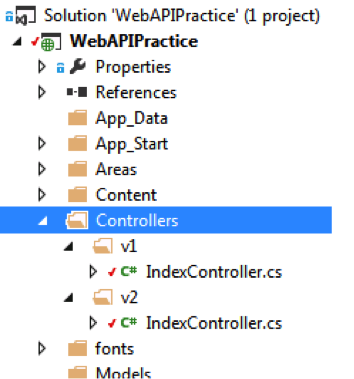 In the Controllers folder, add two folders – V1 and V2 – and create APIs in it with same name. Let’s call them IndexController as shown in the following snapshot. Create a similar method within the controller of namespace V2. This class implements the IHttpRouteConstraint.Match method. The match will return true if the specified parameter name equals the AllowedVersion property, which is initialized in the constructor. Where does the constructor get this value? It gets it from a RoutePrefixAttribute, which we’ll implement now. Now create a similar class ApiVersion2RoutePrefixAttribute in the Routes folder and use it similarly on the IndexController API in the V2 namespace. All that’s left is to implement the custom controller selector and wire it up with the custom constraint we just created. In the following code, we are basically creating a custom controller selector that first identifies all of the controllers available in our assembly. After that, it creates a dictionary and maps the controller with a string key that is comprised of the controller’s fully qualified name (including the namespace). Now at last, we need to register our constraint with ASP.NET Web API so that it gets applied to incoming requests. We also need to configure our custom controller selector. We accomplish this by implementing the WebApiConfig class. The first part of the Register method configures the version constraint. Our ApiVersionConstraint is registered with a constraint resolver, which the framework uses to find and instantiate the appropriate constraint at runtime. The last part of the method wires-in our custom controller selector, replacing the default, namespace-unaware, and controller selector. Run your application and type <<base address>>/api/v1/customers/customers in your browser (the port number and base address will vary for you). This will call the Customers method of the IndexController in the V1 namespace. Similarly, <<base address>>/api/v2/customers/customers will call the Customers method of the IndexController in the V2 namespace. If you add more methods in your controllers, they will work seamlessly. This demonstration shows how we can implement versioning in ASP.Net WebAPI by injecting our custom logic into the MVC controller selection pipeline to force the MVC consider namespace while selecting the controller. This strategy allows us to avoid writing repeated RoutePrefix on each API and adding any hardcoded strings. Shiva Wahi is a Technical Lead at 3Pillar Global. He is a Microsoft Certified Professional with over 10 years of experience in software development. He possess good problem solving skills and has a well-proven ability to convert business requirement into working functional components. He has a strong passion for learning new technologies and using them to solve complex problems with innovative ideas. He holds a Bachelor of Technology degree from GGSIP university, Delhi. Nice article indeed, there is Nuget package available for the controller selector utility https://github.com/Sebazzz/SDammann.WebApi.Versioning I hope we can use this package and insert dependencies for controller selector. 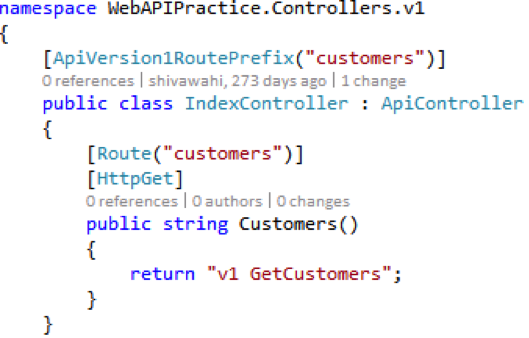 I really like the approach of encapsulating the API/V1 part not to copy and paste in all controllers. Engineering Lead ARI Network Services. I have gone through this article but but it didn’t work me, am facing some issue. can you please help me as soon as possible. Can you please help me for that. Can you please provide me your email ID so we can discuss more related to this error or else if possible then please share your project of this article if you have. Waiting for your positive prompt. What’s your gmail id? I will share the project with you. It is working for me. can you please mail your project on this email id. Shared the project with you on google drive. This should help you. Thanks for sharing this project with me Shiva & its working perfectly. Thank you very very much for this wonderful article. Shiva i need your one help, as per your solution the API version concept is working as expected but here i need one more things like as below. Access using :- api/TestAPI this is not working in your solution which you have shared with me so it is possible to achieve above both scenarios in same solution ? I have achieved that both scenarios within the same solution which i have discussed above. I am also facing same issue. Did we have any solution figured out for this..? I thought one of the requirements was that existing consumers of the API should not be affected. By modifying the route to have a v1 in it, will not the consumers of the API have to modify the url (from hitting just /customers now they have to hit /api/v1/customers) to get their resources? What if I don’t need to create V2 of the controllers yet? I mean in my project, I don’t need to create version 2 yet but in future, i will have to. Will my project run successfully with V1? Can you please share the project with me. My email id is kunnalramteke@gmail.com.